I admit it. I’m good in the crunch. Give me a tight deadline and I’m at my finest. It’s at the peak of stress that I also find myself the most creative. 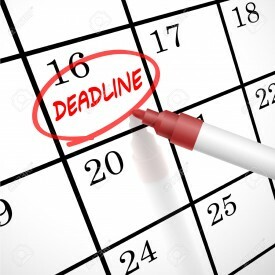 Now, a deadline doesn’t have to be about a life or death, do or die moment. But it does have to be real. A hard, cold stop date and time that can not be moved. And what I’ve discovered over the years is that a deadline works for songwriting, too. After having kids and putting writing to the side for many years, my creativity was jumpstarted by taking a Berklee online songwriting course. The weekly deadline is what did it (and the fabulous instruction of course). Throughout the several week course I practically wrote a new album. A song due each week was heaven for me. After that I ended I took two more. While I wasn’t quite as prolific as the first time around, the deadlines still helped me to make time to write. Next I jumped into co-writing after taking a SongTown course on the subject. That helped, too. Now I was responsible to another writer for doing my part and meeting up (virtually) to write. This was a different kind of deadline, but it also worked!! I found myself leaning more and more on co-writing to get it in gear, however. I even became uncertain that I could actually write a new song all by myself again! But that all changed with my new source of deadlines: the open mic. I’ve made it a habit to try new material at open mics. And because many of the same folks come, it feels nice to change it up with new songs. I searched my catalog. No blues. No song that mentions the word blue. Nada. While it’s not a requirement to play to the theme, it felt like a challenge. So I pulled out a short refrain I had written years and years ago that focuses on the word blue. A bit of a lyric that I had tried to finish a few times before, but that never came together. 1. Tell a friend that you will have a song done by a certain day. Invite them to put it in their calendar and ask you about it. 2. Post an open mic or other public performance date in your calendar and be determined to have something new ready for it. 3. Share new material with a small group of friends or writers on social media. Set a date for new shares. 4. Set up a co-write date and make sure you do your homework before the next meeting. 5. Invite friends to your house to listen to your new music. Then have something ready to share before they arrive!